The Cosmos is a Big Place! A well-known way to measure distances from here to there is by light years. A light year (a measure of distance, not time) is the distance light travels in one year at a speed of 186,000 miles per second—about 6 trillion miles or roughly 250 million trips around Earth. 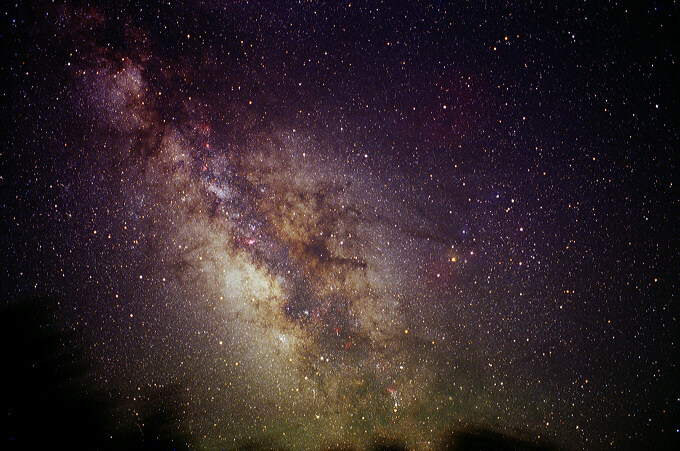 Our galaxy, the Milky Way, is but one among billions much like it. The Milky Way is a plate-shaped disc containing an estimated 200 billion stars. It is roughly 100,000 light years from edge to edge and 3,000 light years thick. About 6,000 of our galaxy’s stars are visible to the naked eye, but only about 2,500 are visible at any given time/location. Our nearest neighboring galaxy is Andromeda, 2.4 million light years away and almost identical in size and composition to our own Milky Way. When you look into the heavens, you are literally looking backward in time. That is because the distances are so great that – even at 186,000 per second – it takes a very long time for light to get from there to here. When you look at a star or another celestial object, what you are seeing is what that object looked like when the light now entering your eyes left its point of origin. For example, Sirius – the “Dog Star” in the winter constellation Canis Major and the brightest star visible in the northern hemisphere – is nine light years away. That means that when you see Sirius this winter you will be seeing it as it looked in 2000. Similarly, when you see Antares – the obviously red star in the summer constellation Scorpius – you are seeing it as it looked in 1409, 42 years before Christopher Columbus’ birth. It is 600 light years distant. If you can find the Lagoon Nebula in the constellation Sagittarius, you will be seeing it as it looked in 2500 BCE! Generally, the first things people learn to find in the night sky are the prominent constellations: Ursa Major (the Great Bear & host to the Big Dipper), Orion (the Hunter), Canis Major (the Big Dog), Scorpius (the Scorpion), etc. These are relatively easy because they are either very prominent, or look something like their names. This is a great start, but is only a gateway to many more interesting objects that are located within the constellations. Things like globular clusters, open clusters, double and multiple stars, nebulae (of several varieties), galaxies, and, of course, the planets can give entrancing views to those who know how to find them. Globular Clusters are densely packed spherical swarms populated by hundreds of thousands to a million or more stars. These star clusters travel in elliptical orbits above and below our galactic plane. They are, in effect, satellites of the Milky Way. There more than 150 such objects associated with our galaxy and the globular cluster stars are some of the oldest in the universe. In binoculars and small scopes, they appear as small, fuzzy balls of light. In large scopes, individual stars can be resolved. These glitter balls provide a stunning sight. Open Clusters are irregular conglomerations of from a dozen to a few thousand young stars traveling together. Stars within a given open cluster have a common origin having been formed in the same mother nebula. Because they have a weaker mutual gravity, they are more loosely bound than the ancient stars in globular clusters. Over time, open clusters stars will eventually disperse. In binoculars and small scopes, open clusters can appear as a handful of diamonds spread across a jeweler’s black velvet display cloth. The Pleiades and Hyades in the winter constellation Taurus (the Bull) are open clusters visible to the naked eye. The Japanese name for the Pleiades is Subaru. Check the logo on the next Subaru you see! Double Stars come in two categories; optical doubles and binary systems. Binary systems are bound together by their gravitational fields. Some binaries have a secondary star orbiting a primary star. Others may be two stars orbiting a common center of gravity. Optical doubles may be light years apart, but appear to us as pairs because they are along the same line of sight. Particularly fun are doubles of different colors such as Albireo in the summer constellation Cygnus (the Swan). Multiple Star systems are also great to observe. A famous multiple star system is epsilon Lyrae in the constellation Lyra (the Harp) also known as the Double Double. Visible to the naked eye, a binocular view will show two bright points of light. Through a telescope, each point can further resolved into a separate binary system. Nebula means fuzzy or unclear (as in nebulous). The classic definition of a nebula referred to any object that could not be focused into a point like a star or a disc like a planet. Therefore, any fuzzy hazy patch observed by early astronomers was called a nebula including the spiral nebulae (what we now call galaxies). These days, we understand more about the true nature of a wide variety of nebula types. The great nebula in the winter constellation Orion along with the Lagoon and Trifid nebulae in Sagittarius (the Archer) are examples of nebulae that are stellar nurseries – active regions of star formation. A careful look at these star factories will often show open clusters nested inside. Another nebula type forms from the remains of an aging star similar to our own sun. A famous example is the Ring Nebula in the summer constellation Lyra. Finally, there are nebulae are created by the colossal explosion of stars many times more massive than our sun. These are the supernova remnants. A famous example, the Crab nebula can be found in the constellation Taurus. On July 4 1054, many people around the world, including the inhabitants of Chaco Canyon, first saw the supernova. It appeared as a brilliant point of light that was visible in the daytime sky for more than 3 weeks! Moreover, while it was exciting news at the time, we have to remember that because of the great distance its parent star, the event actually occurred over 6,000 years earlier. Galaxies are the fundamental building blocks of the universe. Our universe contains an estimated 200 – 300 billion galaxies each one an aggregate of as many as 400 billion stars. Intergalactic distances are enormous. Galaxies are a challenge for casual astronomers, as they often appear only as small, dim bits of fuzz in all but the largest amateur scopes. The Andromeda Galaxy is a notable exception and can be made out with the naked eye on a clear fall night.